Please join Kristina Arquette for gentle chair yoga class. Yoga is about breathing and moving together. This class is for people looking for a gentler approach to yoga and have limited mobility from an injury, illness or age. Chair yoga is also beneficial if you travel frequently, or work at a desk, and want to learn stretches you can do seated. 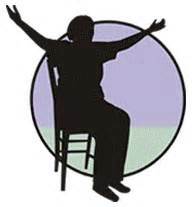 Chair yoga benefits those of all ages, as we work through a series of simple movements that focus on stretching with the use of a chair, while increasing strength, balance, flexibility, self-awareness and stress reduction.